You've always wanted a Ford Raptor, but you've had two problems with it: It isn't powerful enough and the uncovered bed doesn't provide your family and gear with the protection it so sorely needs. 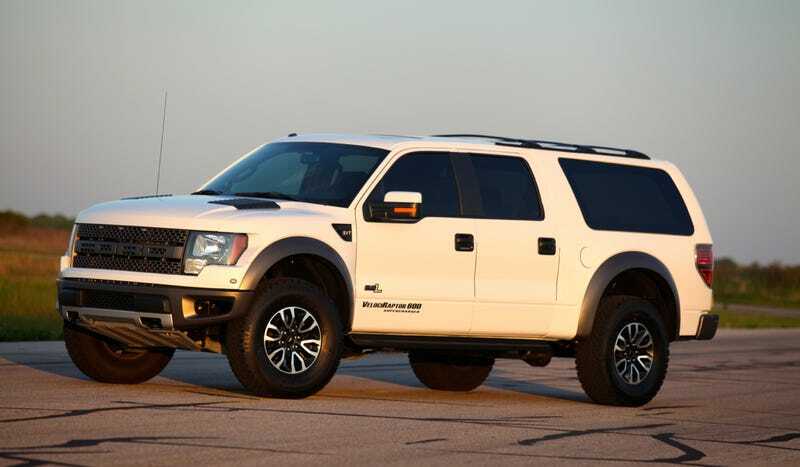 Well, have no fear, Hennessey have come to the rescue with this: The 600 horsepower Velociraptor SUV. Holy crap. Instead of just a cap over the bed, the Velociraptor is a straight up SUV conversion. In fact, it looks a bit like an old Ford Excursion because it has that split tailgate. It offers three rows of seating and probably has the ability to dominate your favorite off road trails with gentle ease. Just now you can take more folks with you. The conversion itself looks pretty good to my eye. If I wasn't in the know I'd assume that it was just a new model from Ford. It looks that natural. Under the hood is 600 horsepower from Hennessey's HPE 600 conversion that is already under the hood of other Raptors that leave the shop. It equates to 459 horsepower and 436 horsepower at the rear wheels, which should be enough to get the kids to soccer practice any morning. As of yet, the Velociraptor SUV has not been tested off-road, which means Hennessey cannot claim that the truck has the same off-road abilities that the original pickup truck has. I doubt the conversion has caused the truck to lose all of its off-road credibility. It has Hennessey's normal set of upgrades like Brembo brakes, upgraded wheels and tires, and also adds custom seating arrangements. Hennessey hasn't released a price, but says that the truck is available "to the select few to require the ultimate in transportation." I think we all require that.